Home > What is a Weather Station and Can it Benefit Ornamental Growers? A weather station is a collection of instruments and sensors that measure atmospheric and soil conditions. Commonly measured environmental variables include light, temperature, relative humidity, rain, and wind. Soil conditions include soil moisture, soil temperature, and soil bulk electrical conductivity. An on-site weather station allows for monitoring of the microclimate in your growing area. Weather conditions can vary over short distances, especially for measurements such as rainfall, which means that off-site measurements - often taken miles away as part of a public weather network - may not be accurate enough for irrigation and/or temperature scheduling purposes. Additionally, cold pockets created by elevation changes can create temperature variability, making local (adjacent to growing areas) weather stations a valuable tool in monitoring and use for irrigation scheduling and freeze protection. This publication is intended to serve as an overview of weather station components and a broad discussion of how a weather station can be used to make cultural decisions, including irrigation, fungicide application, or frost protection. Station placement is critical for accurate measurements. Weather stations should be installed in the growing environment in a flat area away from buildings, pavement, and trees. This is especially critical if the goal of measurements is to warn of impending frost. Placement under a tree or near a structure could alter measurements. Greenhouse structures can also impact measurements, especially light measurements, but plants would also be exposed to the same shading. The key is to place weather station equipment in the growing area. Light is the driving force behind photosynthesis and can be used in plant growth models and/or coupled with water-use models for irrigation management. Light can be measured in terms of shortwave radiation or photosynthetically active radiation (PAR). Shortwave radiation is the total energy of incoming light and is measured using pyranometers. Shortwave radiation measurements can be used to model evapotranspiration—water lost daily via evaporation from soil and transpirational loss by plants—that can then be used for irrigation scheduling. Photosynthetically active radiation measurements over the course of a day can be used to calculate the daily light integral (DLI) if frequent measurements are taken. Ideally, measurements should be taken once per minute or more often. The light used by plants for photosynthesis has wavelengths from 400 to 700 nm. This is photosynthetically active radiation, and it is measured using quantum sensors. Light sensors that measure in lumens, foot-candles, or lux measure how the human eye perceives light. Because human eyes perceive light differently than plants do, such sensors should not be used. For an in-depth discussion of light measurements, refer to “Measuring Daily Light Integral in a Greenhouse,” written by Purdue University Extension specialists Ariana P. Torres and Roberto G. Lopez (https://www.extension.purdue.edu/extmedia/ho/ho-238-w.pdf ). Because the calibration of light sensors drifts over time, they should be recalibrated every two years. For accurate measurements, it’s important to ensure that sensors are level and kept clean. Many sensors come with a leveling plate to enable correct installation. 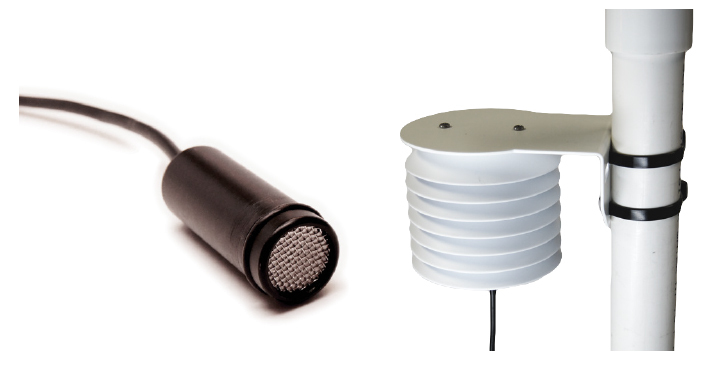 Keep in mind that most commercially available light sensors measure 180 degrees, not 360 degrees, so it is important to place light sensors on top of the weather station so that other instruments do not shade them. Air temperature and relative humidity should be measured in close proximity to each other. Sensors measuring temperature and relative humidity should be enclosed within a radiation shield to enable accurate measurements. Radiation shields protect the sensor from exposure to sunlight (which would heat up the sensor) and allow for airflow around the sensor. Air temperature and relative humidity are key components in calculating vapor pressure deficit (VPD), or how dry the air is given temperature and humidity. In turn, VPD will determine the level of evapotranspiration (ET), which is water loss from plants and soil. For this reason, ET is an accurate means of determining irrigation needs. To simplify how VPD and ET are linked to irrigation, if relative humidity is held constant with increasing temperature, ET increases and irrigation needs increase. Similarly, if temperature is held constant and relative humidity decreases, ET and irrigation needs also increase. For a detailed description of ET, consult “Basics of Evapotranspiration and Evaporation,” written by University of Arizona Extension specialist Paul Brown (https://extension.arizona.edu/sites/extension.arizona.edu/files/pubs/az1194.pdf ). The effects of temperature, relative humidity, and vapor pressure deficit on plant water use are interdependent. The following definitions are useful in understanding the relationships. Dry bulb temperature: The actual temperature of the air. 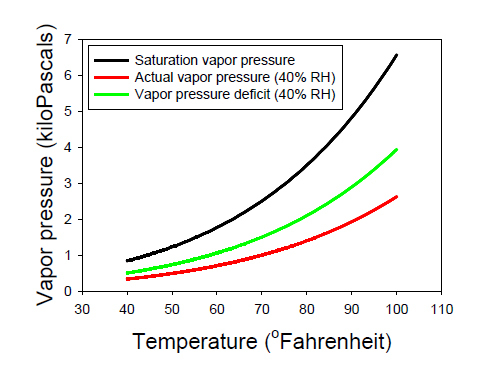 Relative humidity: The ratio between the actual amount of water vapor in the air and maximum amount of water vapor the air can hold at a temperature (expressed as a percentage). Dew point temperature: the temperature to which air must be cooled to completely saturate the air with water vapor (100 percent RH). Vapor pressure: The measurement of the actual amount of water vapor in the air (expressed in pressure units such as kPa). Saturation vapor pressure: The measurement of the maximum amount of water vapor the air can hold; function of temperature, where warmer air can hold more water (expressed in pressure units such as kPa). Vapor pressure deficit: The difference between saturation vapor pressure and vapor pressure (expressed in pressure units such as kPa). Additionally, when determining if frost protection is required, temperature and dew point can be used to calculate the wet bulb temperature, which is always a value between the temperature and dew point. In many cases, software distributed with weather stations can calculate wet bulb temperature continually. For a detailed description of using weather station data to calculate wet bulb temperature, see “Reading the Simplified Psychrometric Chart for Frost Protection” by University of Florida-IFAS Extension specialists Ray Bucklin and Dorota Haman (https://edis.ifas.ufl.edu/pdffiles/AE/AE40600.pdf ). Wind can also affect ET, and thus plant water use, by moving humid air away from the plant canopy or soil/ substrate. Wind reduces the boundary layer resistance for water movement from the crop or soil/substrate to the air. More air movement results in greater evaporation and transpiration. 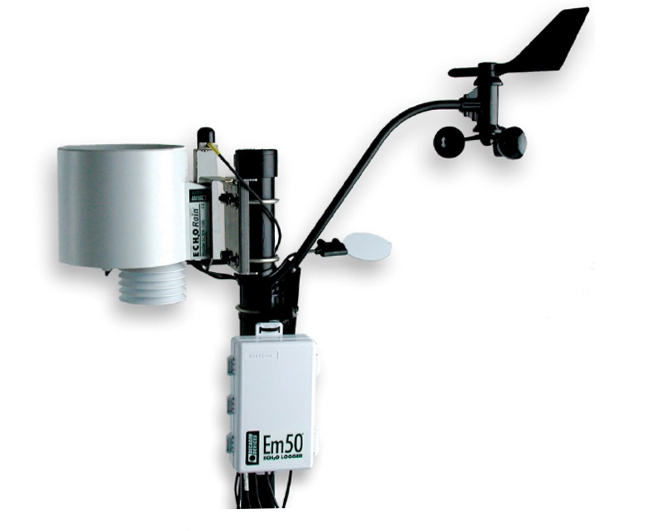 Therefore, if you are purchasing a weather station to calculate ET, you should ensure that an anemometer is included. 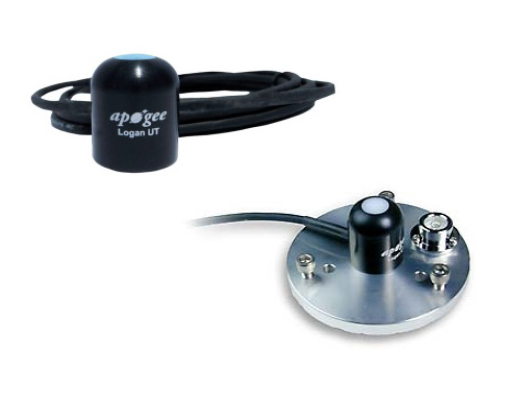 Anemometers measure wind speed via cups, propellers, hot wires, or ultrasonic signals. The number of rotations over a given period is measured by cup and propeller anemometers. 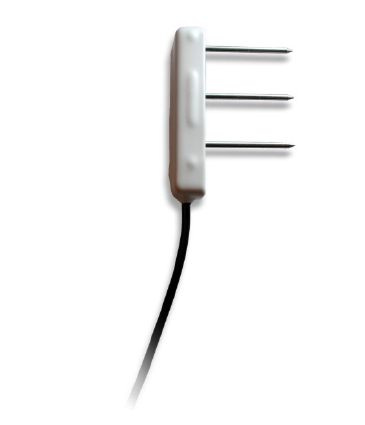 Hot wire anemometers use the change in temperature of a heated wire caused by wind speed. Sonic anemometers measure the time it takes for an ultrasonic pulse to move from one transducer to another, and are more accurate and reliable due to fewer moving parts. Some anemometers also measure wind direction, but this information is typically not critical for growers. 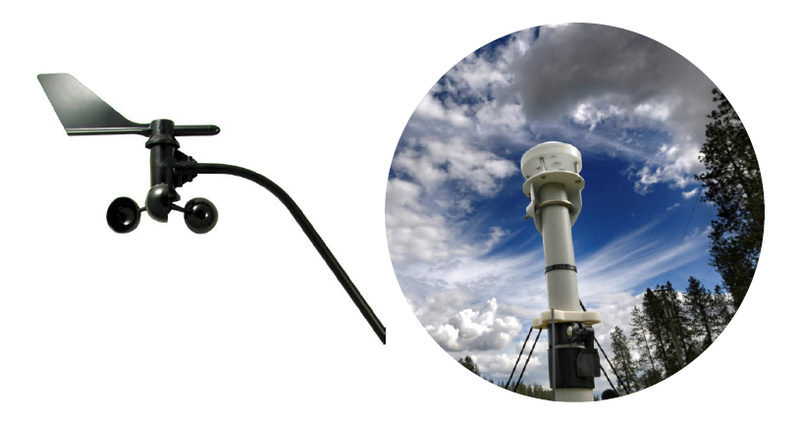 For specific guidelines on weather station placement from Campbell Scientific, see “Weather Station Siting and Installation Tools" (https://s.campbellsci.com/documents/sp/technical-papers/siting.pdf ). Rainfall volume is important for scheduling irrigation. The actual volume, and not just the occurrence of rain, is important for ensuring that the soil/substrate is brought back to the optimal moisture range. 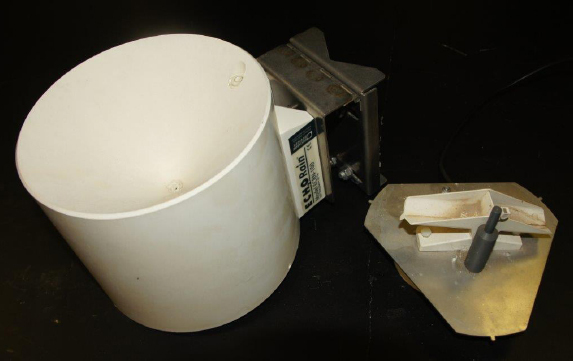 Tipping bucket rain gauges collect rainfall into a funnel and direct the water to measuring spoons. After a certain volume is collected, the spoon tips, and the number of tips is recorded and used to calculate rainfall volume. If heavy rainfall is common, rain gauges with two tipping spoons are preferred over gauges with one tipping spoon. It is important to place a screen device within the cup to prevent clogging by debris and to change or clean filters monthly. It is also important to purchase a rain gauge with the greatest accuracy, as many lower-cost gauges are inaccurate. Leaf wetness sensors can measure canopy or leaf surface moisture and can be used to predict plant disease by the duration of canopy/leaf wetness. Growers can also use the measurements to determine when to irrigate crops that are prone to foliar diseases or when to apply fungicides or bactericides based upon rainfall and dew duration. As an alternative to using ET to determine irrigation needs, a variety of soil moisture sensors have been developed that can be integrated into weather stations that directly measure soil moisture. The three most common types of soil moisture probes used are time domain reflector (TDR), time domain transmission (TDT), and amplitude domain reflectometer. In all cases, sensors measure the volumetric water content (VWC), or the percent of a soil column that is occupied by water. For a detailed description of soil moisture sensors, refer to “Understanding Soil Moisture Sensors: A Fact Sheet for Irrigation Professionals in Virginia” by Virginia Tech Extension specialists David Sample, James Owen, Jeb Fields, and Stefani Barlow (https://pubs.ext.vt.edu/content/dam/pubs_ext_vt_edu/BSE/BSE-198/BSE-198-PDF.pdf ). These sensors can be accurate to within 1 to 5 percent of VWC, but must be calibrated to the specific soil type being monitored. This requires advanced knowledge and laboratory analysis, but some component providers include calibration in the cost (or as an added cost) to the soil moisture sensor. Additionally, newly developed soil moisture sensors concurrently monitor soil moisture, soil temperature, and soil bulk electrical conductivity, a measure of fertility. This function could be beneficial in determining planting dates of field crops, determining heat stress in containerized crops, and determining crop nutrition needs over a growing season. What can I do with weather station data? Setting up a weather station depends on the grower’s goal for the data that is collected. Listed below are typical data that growers will find helpful and that can be adapted to the needs of each specific grower. Irrigation scheduling: Measurements can be used for water balance or other calculated methods of irrigation scheduling, including crop-water-use models. The most commonly used method of irrigation scheduling uses reference evapotranspiration (ET), which determines how water use changes from day to day based on environmental conditions. This requires a complex equation, but many weather stations contain software that calculates ET daily. In these systems, irrigation of the current day is applied to replace water lost the previous day via evaporation from soil and transpiration from the plant. Alternatively, soil moisture sensors are becoming a popular method of determining soil moisture content while monitoring soil temperature and fertility. Degree-day models: Temperature measurements can be used to monitor chilling hours and growing degree hours. As a process of going through winter dormancy and resuming growth in the spring, deciduous woody crops have a chilling requirement (accumulated time below 45 degrees Fahrenheit or 7 degrees Celsius) as well as a growing degree-day requirement (warm temperature exposure above 40 F or 4 C after chilling). These requirements are most important for fruit crops and flowering ornamentals because they determine when plants will bloom in the spring. Freeze protection: Topography, latitude, and elevation can all play a role in the occurrence of freeze events in an area, so site-specific temperature measurements are valuable for freeze/frost protection. Many weather stations include software that calculates wet bulb temperatures and alerts users when frost events are imminent. This fact sheet was published by the University of Georgia in cooperation with Fort Valley State University. * Images courtesy of Decagon Devices.